We recommend that you support the door openings while on a rotisserie by using our adjustable Door Bars. These are absolutely critical for convertibles and when you’re doing rocker repair, but also a good idea for all bodies. They have left and right hand threads on them. Universal mounting plates and a universal joint are on both ends. Adjust them out, bolt them on, and then adjust the center pipe like a big turnbuckle to maintain the opening dimensions for your door. We recommend bolting on the hinge and the striker, but it can also be bolted to the inner panels or other structural member. When you get done, take the car off the rotisserie, unbolt the door bars and you’re good to go. No clean up. They come in 3 sizes depending on your vehicle. and then bolt them on. Long Door Bars adjust from 45” to 62”. Recommended for most unibodies. 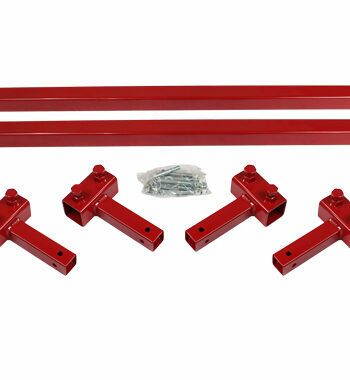 Medium Door Bars adjust form 36” to 53”. Preferred for 55-57 Chevys. 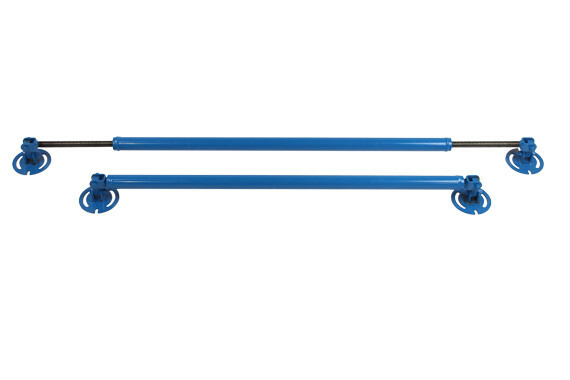 Short Door Bars adjust form 27” to 44”. Good for 55-57 Thunderbirds and imports. Our Mounting Brackets are manufactured in Utah and comes with our 1 year steel warranty. Unless otherwise noted, the Mounting Brackets ship bare steel. Powder Coating is also available for additional charge.